Chuck Winter and Collin Curfman from the Grace Brethren Church in Sunnyside, Washington, have been doing a little historical research on Camp Clear Lake, the Grace Brethren camp sponsored by the churches in the northwest US. 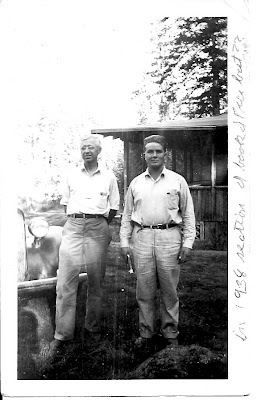 This photo of Earl Reed (left) and Robert Culver (right) was taken at Camp Clear Lake sometime in the early 1940s–perhaps 1944 or 1946, according to Dr. Culver’s memory. Earl Reed was pastor of the Sunnyside church from 1934-46. The chapel at camp is named the Earl Reed Memorial Chapel. Read more about Camp Clear Lake by clicking here.